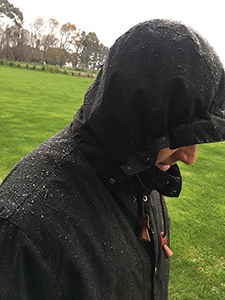 Tired of paying a lot of money for heavy, hot uncomfortable rainwear for use at the nursery, we located and bought a batch of these fabulous waterproof, fleece lined coats made from breathable fabric. We thought they were so good that we're offering them for sale as well. The fleece liner zips out to wear on its own and also to make the coat lightweight and cool for summer use. When in use, the fleece zips right up to the top of the collar to keep you really snug. The coat front zips up with a sturdy zip and has a domed down storm flap to keep you dry. Pockets also have storm flaps on them. We were really impressed with the length as well, it comes down right over your backside to keep you really warm and dry. The coat pictured has been in use for over six months on the farm, stockyards, biffed on the back of the wagon, picking flowers etc, and it's still looking great.